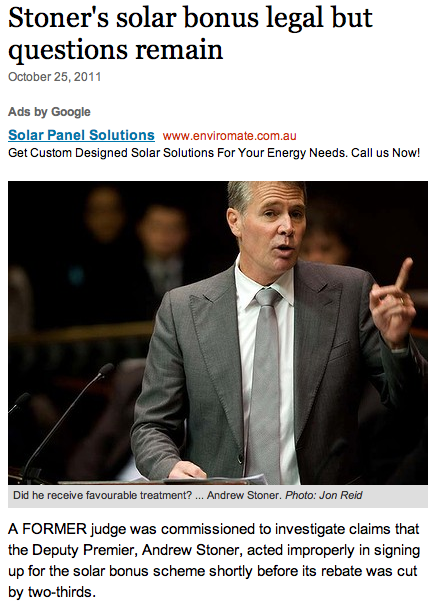 The Andrew Stoner Solar Panel "scandal" has been resurrected once again. 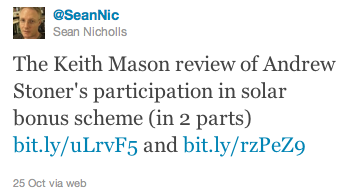 This displeased me greatly, and not just because I needed to come up with a new solar panel based pun for the title of this blogpost. These attacks on Stoner shows an odd desperation on the part of Labor - an unbecoming fervour to splash the mud around in the hope that it sticks. That worked for the NSW Coalition when Labor were in power. To be fair, there were so many corrupt Labor members and ministers that the public didn't need any help from the Coalition to reach that conclusion. Things have been different since March. Steve Cansdell's descent was as rapid as it was unexpected, but he was sacked before the issue could really do much damage to the Coalition's brand. We then had the mystery unnamed senior Liberal minister who was alleged to have been involved in what I'll call some "fairly graphic situations." I should say, in fairness, that his identity has not yet been revealed, despite my view in this post that it was inevitable. It remains to be seen whether that remains the case. The consequence is that the old "stink of corruption" that hung over the Labor government has, to date, eluded the Coalition. This makes Robertson's fervour over Andrew Stoner look disingenuous rather than compelling. In any event, in August it was alleged that Stoner had raced to take advantage of the Solar Panel scheme at the last possible minute. In fact, there was even the (superficially) damaging allegation that he had skipped out on parliament that final afternoon to sign up. As if that wasn't enough, Labor then took the frankly incredible step of having the matter referred to ICAC. It appeared that the installer was a National's member. Further, it was alleged that Stoner's deposit arrived after the deadline for people to sign up for the deal and receive the 60c tariff, meaning that he had potentially received some sort of favourable treatment. It appeared that during estimates this week there was an exchange involving Andrew Stoner where the issue of the solar panels was raised. It was revealed that a report had been prepared by Keith Mason AC QC and provided to the Coalition. The report was duly provided to the committee. The relevant document was produced and is available here (part 1) and here (part 2). It bears a careful reading. As a starting point, I thought it was pretty funny, in light of the topic, that the date on the document is clearly incorrect. The report goes on to detail the times at which the relevant arrangements were made, which was assisted by the fact that Stoner had made many of the arrangements on email. 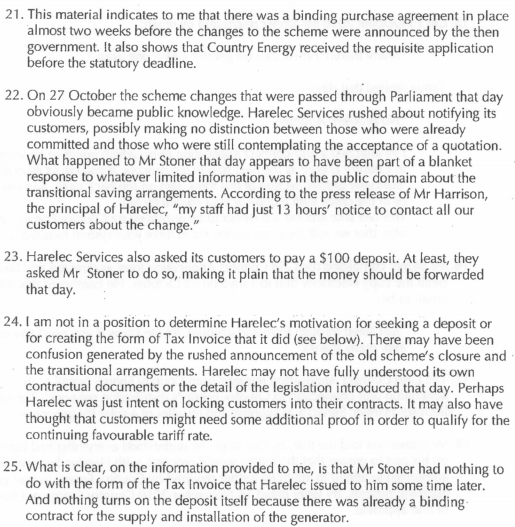 What those emails unambiguously show is that Stoner had entered an agreement to purchase the system well before the date at which he was alleged to have snuck out of parliament to sign up. That allegation was plain incorrect, and Labor owes him an apology for an allegation that is clearly wrong. In any event, when the changes were announced the provider sent what I have no doubt was a quickly composed and semi-panicked email out to a large number of people - most likely anyone who has shown an interest but not yet had their system installed. Stoner received that bulk email asking for a deposit of $100. In accordance with their email, Stoner transferred the funds to the provider. Additionally, confusion was created by the fact that the provider provided the invoices to everyone dated the same day as the email, as opposed to the date they received the funds. 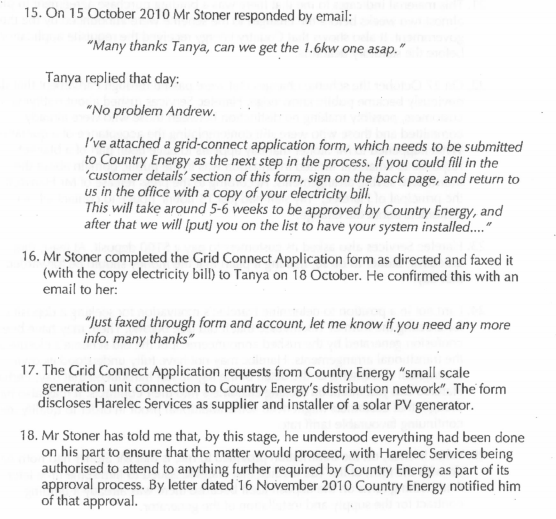 It remains unclear why that was done, but, as far as Andrew Stoner is concerned, nothing turns on it. The report is more than a little refreshing, because it is a report that looks beyond the stupidity of politics to the actual issue: has Andrew Stoner done anything wrong? Unambiguously, the answer is no. I don't suppose he is holding his breath for an apology.